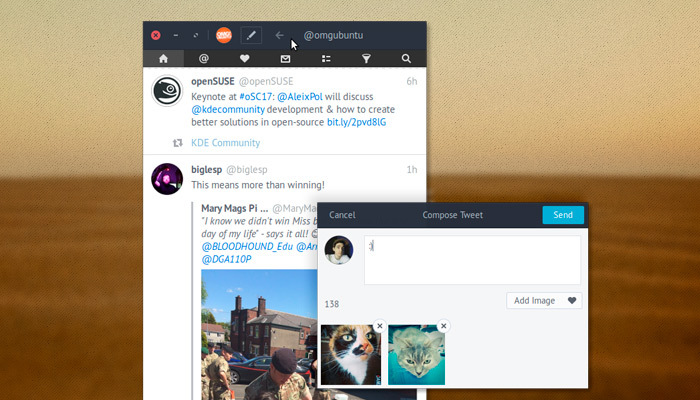 The latest Linux Twitter client Corebird 1.7.1 release has now landed in the MX 17 test repository. We couldn't update it any more on the MX 16 platform, since it requires newer gtk versions. Please give it a try if you use Twitter; perhaps we can add it to the iSO as the default client! Corebird has been updated to 1.7.4 in the test repository. - Fix tweet sending on 32bit architectures. #795 Wtf. Thanks--now with working on 300 followers, this is very handy. Agreed, it picked up my credentials with no problem and loaded the account quickly. Do we have it in the 17.1 ISO? It seems like a good addition. I use corebird all the time as the best way to read Twitter, but lately it was becoming unusable due to screen refreshes that would cause you to lose your place when reading. THANK YOU to whoever did that! Your amazing MX Packagers, that's who! I use Corebird too, and it works very well. Seconded. I often get this error while I’m still catching up with old tweets (presumably, Corebird keeps polling for new tweets even when I’m currently scrolling through sections of my timeline several hours old), so any change that would just let me keep reading the already loaded timeline (make the error less prominent, ignore it, whatever) would be very highly appreciated. Maybe I misunderstood whether 1.74 has this incorporated or not -- If you're not having that problem then maybe so -- if you are, I may need to try to figure some way to rebuild with that patch. TWITTER is my primary news source, set up to of course get the feeds I like, and having a distraction free list like Corebird provides is really great. I've been looking for alternatives (even rainbowstream) and I'm not even really that concerned if Twitter breaks the auto-update functionality. Jerry it sounds like you're probably using it much as I do, so if you find a better alternative please let me know --- thanks!